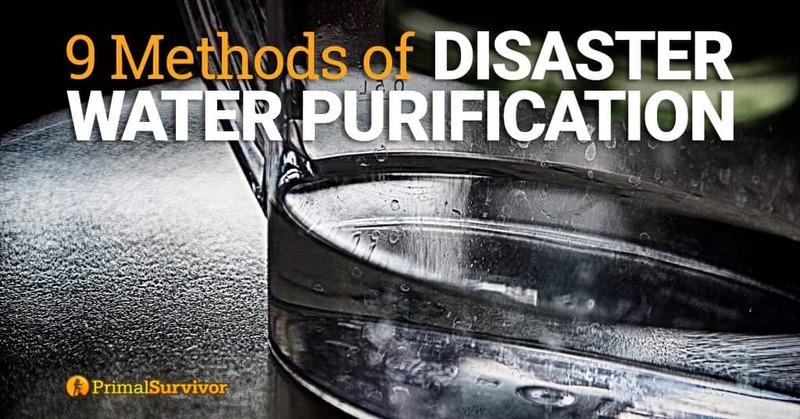 Having a method of purifying water is one of the most important parts of disaster prepping. But it is also one of the most confusing. 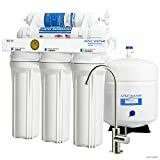 There is a LOT of information out there about water purification systems, and a lot of the info is purposely misleading because companies want you to buy their products. The reality is that there is no one “best” method of purifying water in disaster situations. Which water purification method to use depends on your situation and the types of threats present. 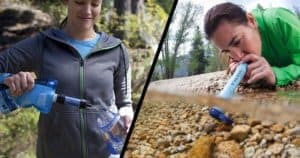 For example, a water treatment system designed for backcountry use where viruses aren’t likely probably won’t be safe for treating flood water in an urban environment. Here is an overview of the 9 methods of disaster water purification and the pros/cons of each. Below the graphic is more detailed info about each method. Boiling is a good way to treat water in most types of common disaster situations, such as grid outages when the water treatment center stops working. Most sources (including FEMA and the Red Cross) say that you need to boil water for 1 minute to kill bacteria, viruses, parasites, etc. The most common chemical treatment for water is chlorine bleach. 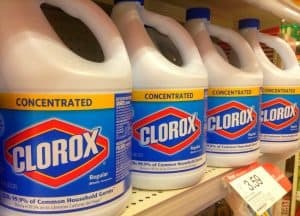 Make sure it is unscented bleach with no added cleaners. It should say 8.25% sodium hypochlorite on the label. To treat water with bleach, you’ll need to add 6 drops per gallon of water and let it sit for 30 minutes. When I talk about mechanical filters, I’m not talking about your standard Brita home filter. An emergency water filter should have a pore size of no larger than 0.2 microns to ensure it removes all bacteria and parasitic threats. A filter will never remove viruses though, so this is NOT suitable for treating flood water. Carbon filters don’t “catch” impurities like a mechanical water filter does. Rather, they absorb the impurity. Once they reach their maximum absorption threshold, they will start to leak! The time it takes to reach that point varies. So, in an emergency situation where the water might be very contaminated, you’d have to guess as when to change the filter. You can buy activated charcoal on Amazon or even make it yourself. Ultraviolet light water treatments are actually pretty cool. You basically stick a wand into the water which emits the UV light. The UV light scrambles the DNA of microbes and viruses, thus making them harmless. Be warned that, if you let the treated water sit for a while, the DNA can become unscrambled! So you have to treat the water each time before using it. UV water treatment systems also rely on batteries, which could be a problem in certain disaster scenarios. Reverse osmosis works by forcing pressurized water through a semi-permeable membrane which has a pore size of no more than 0.1 nanometer. This makes it effective in purifying water of microorganisms, chemicals, heavy metals, and even radioactive materials. You can have at look at a system on Amazon here. 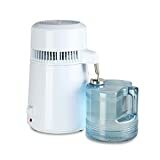 Most home water distillers work by boiling water and then collecting the steam. The steam is channeled into a separate container where the vapor cools and turns back into water. The idea behind distillation is that microorganisms and pollutants are left behind. Note, however, that some organic chemicals like pesticides and VOCs readily convert to vapor, so a distiller won’t remove these. 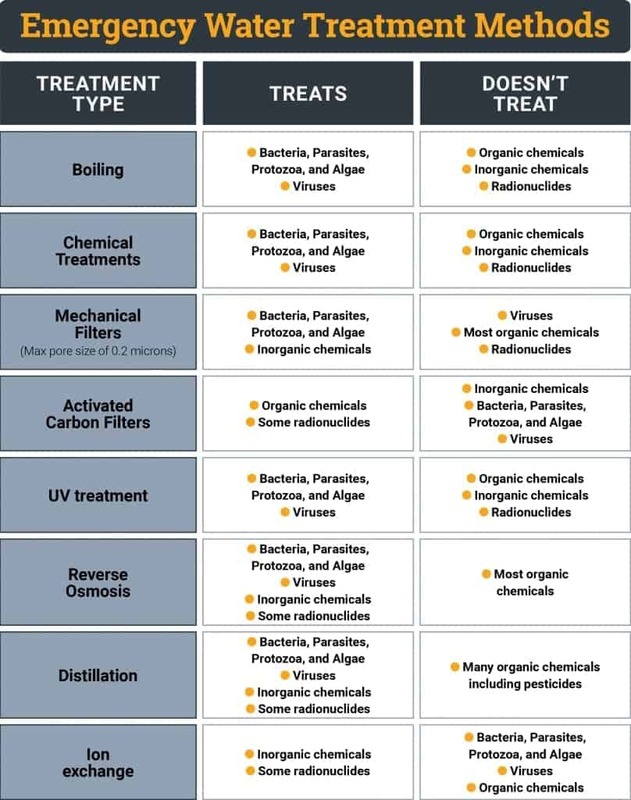 However, most home distillation systems do have special pre-filters for removing these threats. 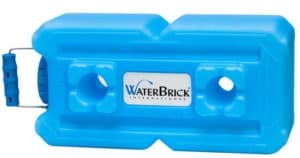 Without getting to technical, ion exchange water treatment systems rely on porous polymer beads. When water hits the surface of the beads, it causes a release of ions. The result is that “bad” ions are exchanged for “good” ions. Ion exchange systems don’t really purify water since they only remove heavy metals and some organic chemicals. Thus, they are considered water softeners. But, if you are worried about arsenic, lead, mercury, or other toxic heavy metals in your drinking water, an ion exchange system would be good. Rainwater catchment is actually a form of distillation since the sun evaporates the water into vapor and then, when it collects and cools in the sky, it comes back in the form of rain. However, you don’t get a pre-filter with rain so it could contain lots of organic chemicals in it (acid rain, anyone?). You’ll also have to be careful about how you catch and store your rainwater so bacteria and mold don’t start to grow! If you have no other way to treat water though in an emergency, rainwater is one of the cleanest, safest options (barring nuclear emergencies and chemical attacks). As you can see, no one method of water treatment is perfect. If you want to be prepared for all types of disasters which may strike, then you will need to have multiple methods of treating water! Before you get scared and rush out to buy every type of water treatment system available, think about what disaster types are likely where you live and what would happen in the aftermath. For example, if you live near a lot of industry or agriculture, you’ll want a way to get those organic chemicals out of the water! Hopefully it will never come to this because you’ve got enough water stockpiled to get you through a disaster, but you can never be too prepared! 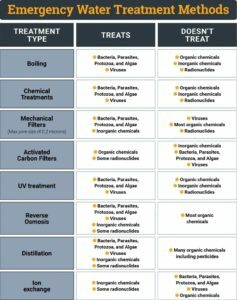 What emergency water treatment method do you have? Building a science fair project out of emergency water treatment issues. This site was helpful! Great to hear, appreciate the comment.